Australians Troy Corser (Aprilia) and Troy Bayliss (Ducati) dominated Sunday's superbike fest. For Corser it was a return to form for the former world champ, while for Bayliss it was a case of making the most of his stand-in role for regular Ducati pilot Carl Fogarty. Race 1: Troy Corser made it a perfect start to his race day with a fine win in the opening race, enjoying an eight second gap over Troy Bayliss, who fought through from a poor start. Katsuaki Fujiwara delivered on his practice promise, taking his first ever WSS podium, with Juan Borja just missing out in fourth place. Akira Yanagawa, another slow starter made it through to fifth, with Ben Bostrom on the NCR private Ducati in a fine sixth. World Championship leader Colin Edwards and his Castrol Honda team mate, Aaron Slight, collided on lap two, with both crashing out of the race. Pierfrancesco Chili failed to finish due to a machine problem. Race 2: Troy Corser�s first ever double win as an Aprilia Axo factory rider gave him a perfect weekend at Misano, scoring fastest in regular qualifying, Superpole, two race wins, two race fastest laps and a new lap record of 1:35.986 at the modified Santamonica circuit. In a good weekend for the relatively inexperienced men, Troy Bayliss of the Ducati Infostrada team took second ahead of NCR Ducati�s Ben Bostrom, who took his first World Superbike podium since his win as a wild card rider at the Laguna Seca circuit last season. Katsuaki Fujiwara just missed out on his second podium of the day on his Alstare Suzuki, with Juan Borja on the Ducati Infostrada machine once more fully competitive in the run up to his home race in Valencia, Spain next weekend. Fuchs Kawasaki�s Akira Yanagawa took sixth place, ahead of Corser�s team mate, Alessandro Antonello, who took a fighting seventh on what is almost his home circuit. Peter Goddard, a replacement for Gregorio Lavilla had another strong ride to eighth, and he has been confirmed as a starter for the Fuchs Kawasaki team at the Valencia race next weekend. 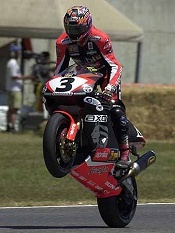 Aaron Slight and Colin Edwards had unusually low finishing positions of ninth and tenth on their VTR1000 SPW Castrol Hondas, although Edwards has held on to his World Superbike championship lead, heading up Troy Corser, 208 points to 170. Pierfrancesco Chili has fractured his left collarbone after falling in the middle of the Variante Arena chicane. In the Supersport World Championship Jörg Teuchert took third place and the championship lead on his Alpha Technik Yamaha after previous leader James Whitham crashed out while chasing through the field on his Yamaha Belgarda machine. Teuchert�s team mate, Christian Kellner, took his first ever World Supersport win from local hero Paolo Casoli, after a forceful overtake on the penultimate lap relegated the Ducati Infostrada man to second. Teuchert now leads Whitham by eight points, but reigning World Champion Stephane Chambon may well be out of the overall championship race now after suffering a complicated fracture of the collarbone which means he too will miss the next race at Valencia. Motorcycles are getting caught in international trade wars, with the revival of a plan in the USA to place a 100 per cent excise on Euro 50-500cc bikes. Apparently this in retaliation for a Euro exercise on American beef imports. For the Trivia buffs ... Cycle News in the USA reports: "The clocks were turned back when PJ1 Racing's Jimmy Filice won the MBNA 250cc Grand Prix under a light drizzle at New Hampshire International Speedway. The last time Filice won an AMA race was on September 24, 1995 at Firebird Raceway in Phoenix, Arizona. "The Yamaha-mounted 37-year-old ran down early leader Jeffrey Wood on the Penguin Racing School Yamaha on the fourth of 24 laps, then went away." Filice partnered John Kocinski in a Castrol Six-Hour in the late eighties in Australia, on a Yamaha. It was part of a program to import talent and develop new riders. The duo on the other Marlboro-backed Yamaha in the race was Michael Dowson and Kevin Magee. Okay, what was the year, and the bike model? E-mail us at allmoto@netspace.net.au with your reply. From Dorna (GP supremos): "The end of 2000 will see the launch of the official video game of MotoGP for the Sony Playstation 2 platform. Namco designers and software engineers, with a team of 40 people, are currently developing the new game at their studios in Tokyo. "The new video game is defined as a motorcycle racing simulation game (Really? - Ed) and has been designed with the advice of the three Aoki brothers, all three having the experience of racing in MotoGP. "Five different tracks can be raced on in the new game: Suzuka and Motegi (Japan), Jerez (Spain), Paul Ricard (France) and Donington Park (Great Britain). All five have been reproduced with their 1999 MotoGP layout and they have been recreated with a huge level of realism, so that players can feel that they are actually riding a 500cc machine in the World Championship. "There will be several different competition modes: time attack (like a qualifying session, the player has to improve his own lap-times), versus mode (two players racing each other) , the Namco World Grand Prix (the player racing against the whole 500cc field in all the racetracks) and others." Our expert PC doctor, young Noel Wiltshire, reckons the MkI version of the game was good in most respects and scarily realistic. We suggest making your own play-leathers with bits of old carpet in place of knee-scrapers. The Australian Safari has been upgraded and included on the World Cup calendar for international motorcycling cross country rally events in 2001. Australia will host the fourth of six rounds in the Federation Internationale Motocycliste (FIM) Cross Country Rallies World Cup as part of next year's Safari, which is scheduled to be held from August 19-26 and will also include an Auto Division for four-wheel-drive vehicles. The FIM's decision to allocate World Cup motorcycling status to the Safari virtually guarantees the participation of the high-profile overseas factory-supported KTM, Yamaha, Honda, and Husqvarna teams who contest the series, and possibly BMW, who dominated this year's Paris-Dakar event. In response to last week's lead story on a 2WD bike from Yamaha: "Unless my memory is very bad, about May/June 1969 or May/June 1970, at a scrambles meeting at Barrabool near Geelong Victoria, there was a demonstration of a Husqvarna scrambles bike (now called Moto-Cross) with an automatic gearbox. "But the interesting thing was that there was also a more experimental machine that had 2WD using hydraulic fluid to drive a sprocket which was between the triple clamps on the front forks and this drove the front wheel in combination with the rear by using the same torque converter as the gearbox and splitting the power. "I was in Denmark in 1982 and stayed with the Danish Suzuki importer. Whilst there, we had a visit from some Swedish dealers and the conversation came up about this 2WD dirt bike. It appears that the original reason behind 2WD was to enable one to traverse ice and snow more easily and the Swedish military had asked Husqvarna to look into the possibilities of a border bike that could be ridden by relative newcomers to motorcycling. "Therefore the automatic gearbox and the 2WD were incorporated but apparently it didn't become a commercial reality. Probably because of the inherent costs and all of that kind of stuff!" Meeting results: 1. Bolley, 2. Pichon SUZUKI, 3. Coppins SUZUKI, 4. Demaria, 5. Federici, 6. Cooper. Overall points: 1. Pichon SUZUKI 249, 2. Bolley 217, 3. Beirer 159, 4. Coppins SUZUKI. 143, 5. Federici 126, 6. Cooper 113. Have a squiz at our free motorcycle classifieds in the Garage Sale section of the same site - advertisers tell us it's getting a good response. You can drop in your own ad on-line while you're there. There are a few of rally and event notices we need to get through. If you�d like your event added to the list, e-mail us now at allmoto@netspace.net.au. Honda Riders Club of Australia annual rally. This year its's at Batemans Bay in sunny NSW, where you should be wary of the local parking nazis. Otherwise a great place to visit and the event usually turns on plenty of entertainment along with demos rides etcetera. See you local dealer. The Great Honda Road Ride. This leaves from the HRCA Rally and does a loop of the country. You're able to do the whole thing, or just join in varying sections. Again, see your dealer for details. Ducati Turismo 2000: start Sydney, finish North Coast of NSW (full details not finalised as yet). Includes a number of activities and displays including tech seminars, test rides, a concours event,formal dinner and much more. For further details contact Steve Reeves at NF Importers, tel (02) 9748 7833. Triumph Rally, Jindabyne, NSW. This is a big event, which takes over one of the major resorts up in the Snowy Mountains. A great excuse to get in among some of the world's best riding territory and the brand usually uses this to show off a new model. See your local dealer.